So, today’s review we want to devote to games that are made in the popular genre of scrolling shooters. This genre was popular in the late 80s – early 90s. But as soon as computer games began to gain momentum, this genre faded into the background, and on the pedestal, there were more advanced and dynamic games with an exciting game process and storyline. But still there are those mobile game developers who have not forgotten about the once popular genre and now it is gaining its former popularity on smartphones and tablets running Android. So, in today’s selection of games, you will find products like Aces of the Luftwaffe, Sine Mora, Radiant, AirAttack and the famous Sky Force 2014. 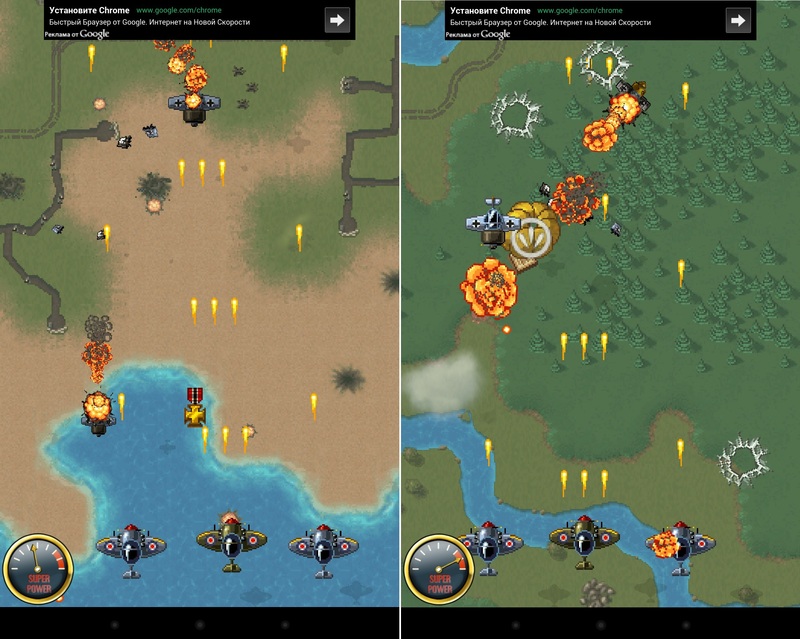 Aces of the Luftwaffe is a game that appeared on Google Play for a long time. The first versions of the game could be found during the reign of Java games. But, despite its decent age, the popular game series was able to get to modern devices equipped with operating systems such as Android, Windows Phone and iOS. The gameplay in the game is pretty standard. At our disposal, there will be a plane that will fly from bottom to top and simultaneously destroy enemies, and we can only control its movement and in time dodge obstacles and shoot enemies. Also in the game, there are many bonuses and various improvements that can diversify the gameplay and make it more fun. The only drawback of the game is the abundance of bright effects, which are expressed in explosions, bright flashes, and similar phenomena, because of which it is not clear where their own and where others are. You can download the game for free, but you will have to watch ads and run into in-game purchases. 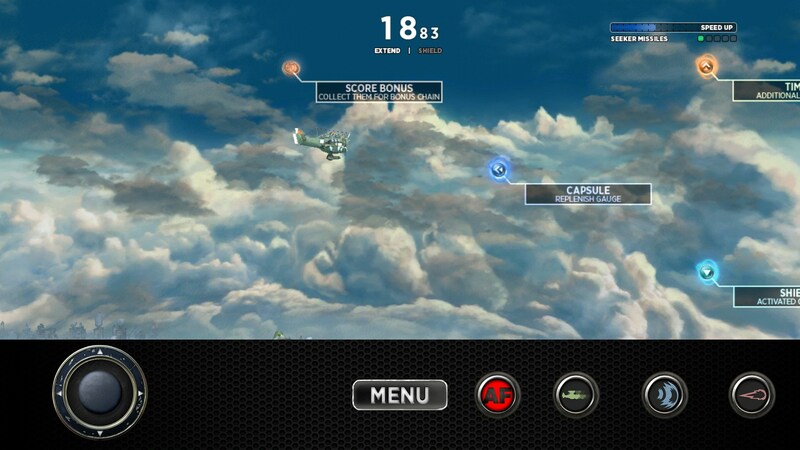 Sine Mora is a very bright and entertaining game for Android devices, made in the genre of vertical scrolling shooter. This game is one of the few that switched to the Android platform from the Xbox 360 console. Therefore, we get excellent three-dimensional graphics, an interesting plot and high-quality gameplay. In addition to nice graphics, I would like to mention a rather complicated gameplay that will make even the most skilled users sweat. On top of that, there are a lot of dangerous bosses and a very convenient control, which is carried out using a virtual joystick on the left side of the display and four additional buttons on the right side. At first glance, a very large space is allocated for the control panel, but over time you realize that it is so much more convenient to be controlled by a tiny plane. The game is cool and all fans of this genre should try it on their devices. In Google Play, the game is distributed only for a fee, but in return, you will receive an interesting and exciting game with nice graphics, no ads, and donations. A full story and many interesting missions. 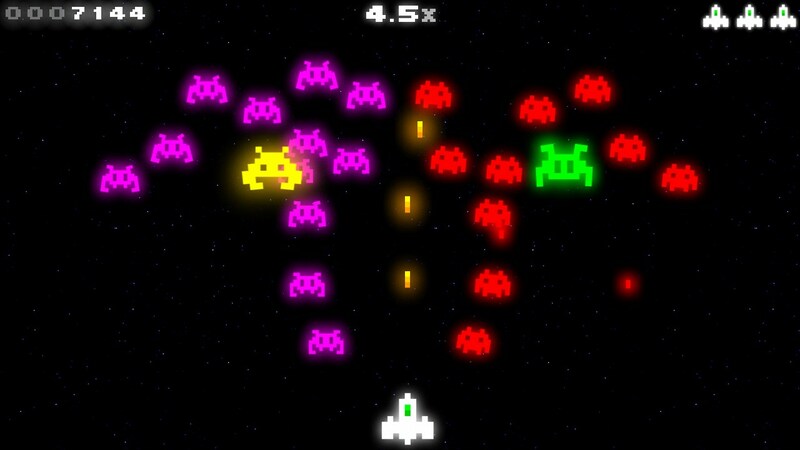 Radiant is a modern version of the classic game called Galaga, which was once popular on the Dandy game console. In this toy, you have to take control of a small spacecraft that needs to fly across the expanses of space and destroy enemy ships and asteroids that will fly straight at you. The developers decided to give the game the most simple control, so the user can only move the ship from the left to the right, and the shots at this time will be made automatically. In the game, we are waiting for three levels of complexity, each of which differs in the number of lives, enemies and the degree of damage that our ship can withstand. In general, the game contains classic elements of games of this genre, so if you want to plunge into childhood, then perhaps Radiant will be a real gift for you. On Google Play, the game is available in two versions: the free version contains the first 30 levels, and the paid version includes all the other packs. There is also a separate version, made in HD, which is practically no different from the above versions of the game. Six types of weapons and more. 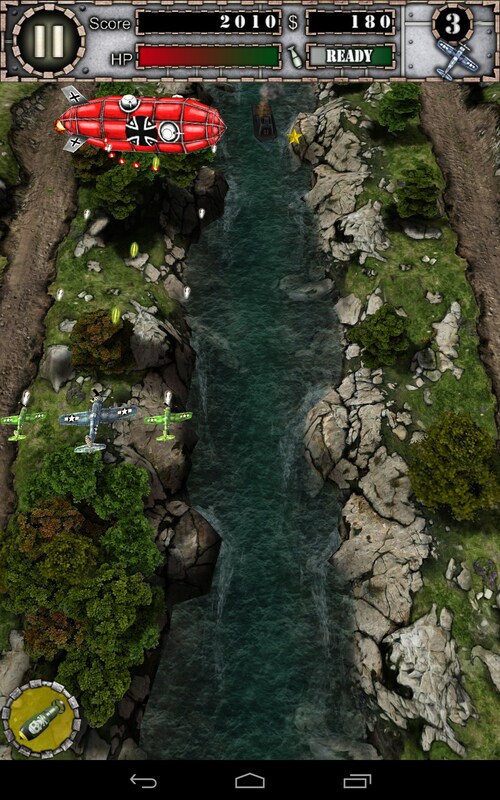 AirAttack – one of the best games made in the genre of vertical scrolling shooters. In the game, you will find high-quality three-dimensional graphics, interesting and addictive gameplay and several “chips” that the developers have prepared for you. Just want to say that this is the only such game in which the user can easily switch between portrait and landscape modes without losing the quality of the picture. That is, the developers have managed to make a fully surround the game, which will adapt to the size of your display. The gameplay itself is not distinguished by its uniqueness, and we still have to control the plane and carry out various missions to destroy certain objects, enemy equipment and the like. On Google Play, there are two versions of the game: a trial, which contains only three levels and the full version, which is bought for 89 rubles. The game is worth the money, do not regret the money spent and time. Destructible objects and beautiful effects. 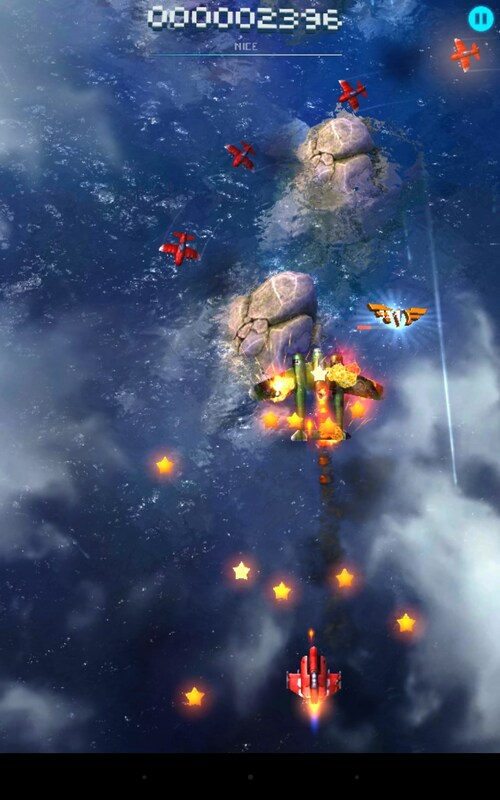 Sky Force 2014 is the best scrolling shooter for Android devices I’ve ever seen on mobile platforms. The game is a reworked version of the game that was released over 10 years ago. The developers have changed not only the graphics but the gameplay itself, which can exclaim the most avid gamers. Each level in the game received an excellent drawing, while each new location will differ significantly from the previous one. In addition, the location itself will change, you have to fight with more complex enemies, which are made in the form of fast fighters, powerful bombers, cruisers, and even tanks. Well, in the end, you, of course, expect a colorful boss. To open new levels in the game you need points, which you can get for completing tasks: destroy all enemies, save armored vehicles or people. Game currency in the game is presented in the form of stars, which falls out of destroyed opponents. It can be used to improve the performance of our aircraft. A game that deserves your attention, and it doesn’t matter if you played it before or saw it for the first time. You can download it on Google Play for free, but with this, you will get pop-up ads and in-game purchases. The games presented in this review can be called a classic of the scrolling shooter genre. If you want to plunge into the world when the console and game consoles ruled the ball, then feel free to go to Google Play and download (buy) the game you like. I really liked the good old game called Sky Force 2014. Your choice depends solely on you.